Approximately 80% of women aged 40 and up undergo the process of decreased reproductive functioning known as menopause. In the early stages, the process is characterized by irregular or intermittent menstruation. In the later stages, when menstruation has ceased, women experience what is commonly known as hot flashes, accompanied by sweating, a bloated feeling, dry skin, vaginal dryness, mood swings and sleep disturbances. What is actually happening is the cessation of the process of ovulation during which there is a significant drop in hormone levels of estrogen and progesterone. The sudden decrease in these hormones cause a kind of hormonal confusion in the body. Conventional treatment methods therefore attempt to replace the missing hormones. However, a growing number of doctors claim that such treatment involves a possible health risk, citing increased risk of breast cancer or uterine cancer. A new approach gaining popularity focuses on nutrient supplements. The disturbing symptoms of menopause can be overcome through use of curative herbs that act like the missing hormones, without the risk factor. Homeotreat Lab has studied the phenomena and is now ready to offer their conclusions in a new formulation called Meno Feminine. The ingredients of Meno Feminine effectively give women back their quality of life, without discomforting side effects. 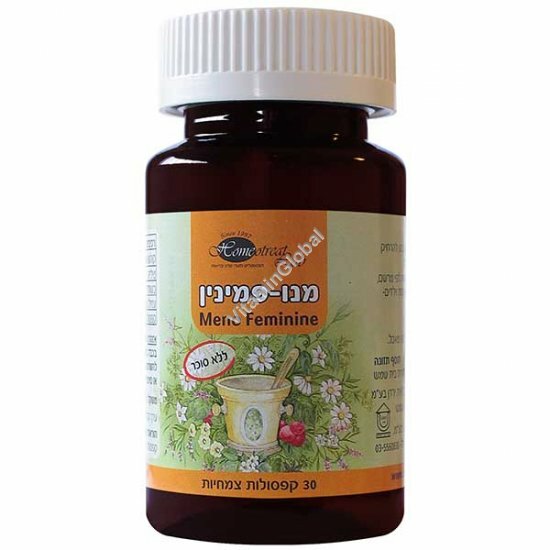 Meno Feminine - the new Homeotreat product comes in a package of 30 tablets containing various plant extracts (fito-hormones) in optimal dosages. This contains substances such as: Farnesol, Flavonoid, Quercetosid, Hespapidin, and Astralgin. These ingredients act like progesterone having a calming effect and counteracting tension and anxiety. It also prevents feelings of bloating and drying of mucous membranes. Hops concentrate(SIPF) SIPF is a special procedure for obtaining extracts that maintains the full effectiveness of the active ingredients. This ingredient contains vital fats such as Humulone, Myzcene, Colupulong B and Flavinoids including Quercitin, Astralagin, Rutin, Estrogen-like substances, Lupolene, and lumolene. These ingredients work together with the Tilia plant in synergy to decrease hot flashes and feelings of feverishness. The hops concentrate regulates the cycle and in some cases may even delay the disappearance of the menstrual cycle. It improves the quality of sleep, preventing sleep disturbances by strengthening and soothing the nervous system and reducing tension and anxiety. The root of the Black Cohosh, which grows mainly in North America, has estrogenic properties due to the presence of the active ingredient Formononentin, a member of the family of Isoflavons which competitively attach to estrogen receptors and activates them. It is important to note that Isoflavons of this type have no negative effects on breast tissue. On the contrary, due to the presence of Salicylats in Black Cohosh, this plant has anti-inflammatory properties, and due to the presence of Silicates it contributes to the healthy composition of the bones. In addition, black cohosh also takes an active part in reducing and preventing hot flashes, tension and anxiety. It is capable of preventing heart palpitations (Tachycardia), and atrophy of vaginal mucous, and regulates the menstrual cycle and reduces menstrual cramps by relaxing the uterine muscles. It acts as an anti-depressant and minimizes mood swings. Tablets. Each tablet is equivalent to 10 calories. The tablets do not contain sugar, salt, gluten, soy. Instructions for use: Take one tablet a day, before bedtime. The information contained in this site is not intended as medical guidance nor as suggestions for medical treatment.